Used for cutting thin wall steel and non-ferrous tubing. BW incorporates an alternate top bevel. Ground on blades with a tooth pitch less than 4.00 mm. Used for solid sections & thick wall tubing. Most commonly used tooth style for cutting ferrous & non-ferrous material. The triple chip design splits the kerf between two teeth. Ground on blades with a tooth pitch greater than 4.00 mm. High Speed Steel (HSS) circular saw blades are predominantly used for cutting tubes, pipes, sections and solid steel based materials. Extremely high output is achieved with cutting speeds up to 250m/min. Reduced material waste and increased production rates are available with advanced coating technology. 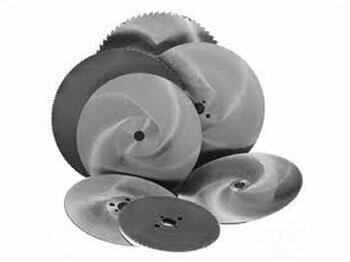 Cold saw blades are circular metal cutting saw blades that are resharpenable and may be used many times before being discarded. 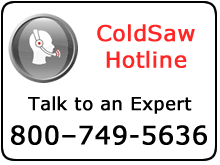 Cold saw blades are used to cut metal using a relatively slow rotational speed, and a high chip load per tooth. These blades are driven by a high power motor and high-torque gear reduction unit or an AC vector drive. During the cutting process, the metal is released in a shearing action by the teeth as the blade turns and the feed mechanism moves the blade forward. 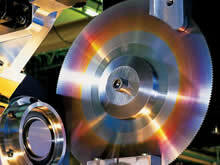 They are called "cold saw blades" because they transfer all the energy and heat created during the cutting process to the chip. This enables the blade and the work material to remain cold. 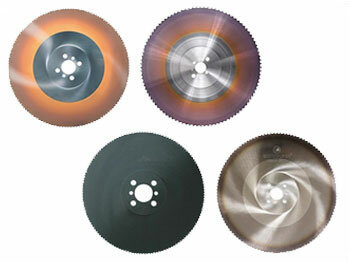 A vapor treated saw blade has a Ferric Oxide surface coating for a longer blade life. It is mainly used for cutting steel on manual and semi-automatic sawing machines. This general purpose blade comes with a pinhole configuration set designed to fit any coldsaw. Economy 3000 blades have a sophisticated coating for wear protection. Ideal for cutting thin wall tubes and profiles, in mild and stainless steel, this blade cuts much faster than a steam treated blade. 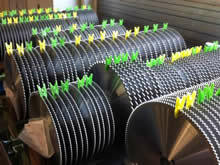 Higher cutting speeds can be achieved as the coating protects the saw blade against side welding. The pinhole configuration set is designed to fit any coldsaw.